The system of voicemails has significantly improved our communication system. Previously we were not able to get to know why someone had called if you miss their call. We had to call the person back or text them back to know why they wanted to talk to us. But things have changed since the arrival of the concept of voicemail. If you have voicemail enabled on your iPhone, then your friends and family members can send a voice note of the message they wanted to convey. But after some time, you might face storage issues in your iPhone. Well now, you do not have to delete your old voicemails to save new ones anymore. 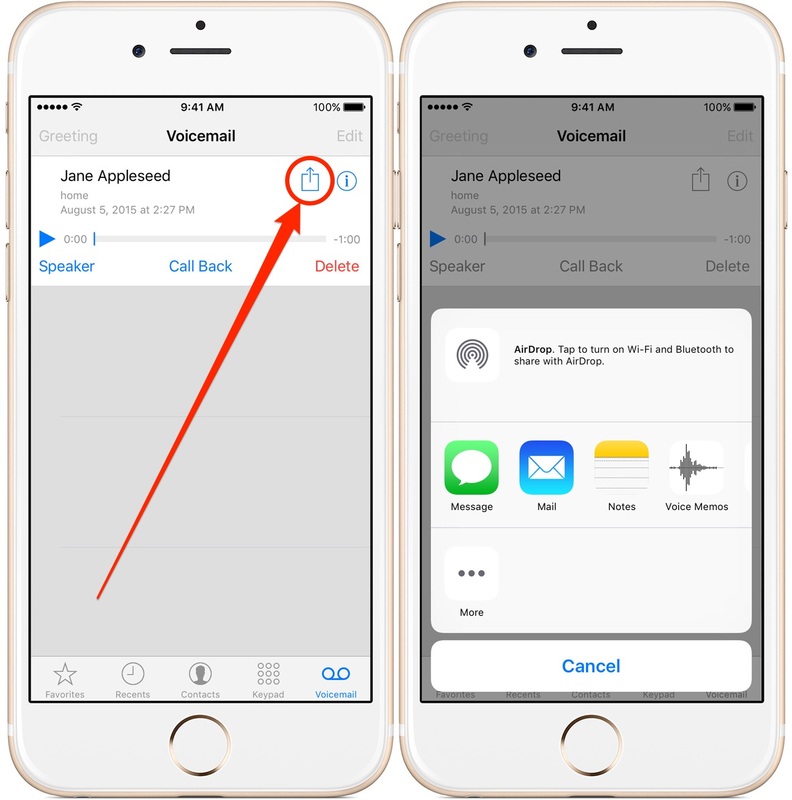 You can now forward your voicemails on your iPhone (running on IOS 9) to other storage places. You can also add your voicemails to Google Drive. Voicemails can also be shared over messages or chat texts. You can also save your voicemails as chats in various third-party chat applications like Viber, WhatsApp, WeChat etc. Voicemails can also be stored in the Documents folder. All the above storage and sharing options pop up when you click on the share button on the top left corner of your phone. All these applications will then store your voicemails which you can easily access later in the future. Basically, you can store your voicemails in any application which supports .m4a files. With the voicemail saving, sharing and forwarding feature, you don’t have to delete your old voicemails anymore. With unlimited storage space of the above-mentioned storage units, you can now save as many voicemails as you want. then you have come to the right place. This advanced feature of the IOS 9 iPhones has made life much easier. When you miss a call from your friend, colleague or family member, they can just send a voicemail to you. You can now save this voicemail for any future use. You can share your iPhone voicemails with others through message chats and emails. One of the easiest and fastest methods of voicemail sharing is through Airdrop. Airdrop is a sharing feature that only iPhone users can avail. It enables the user to share various forms of data like pictures, videos, mp3 files, text, voicemails etc. to other IOS devices. It takes some mere milliseconds of time to share it with other IOS devices. We have made a list of instructions of how to forward a voicemail on iPhone so that you can easily save and share your voicemails with others. Launch the Phone app by tapping on it. Select the sharing or saving option that you want. 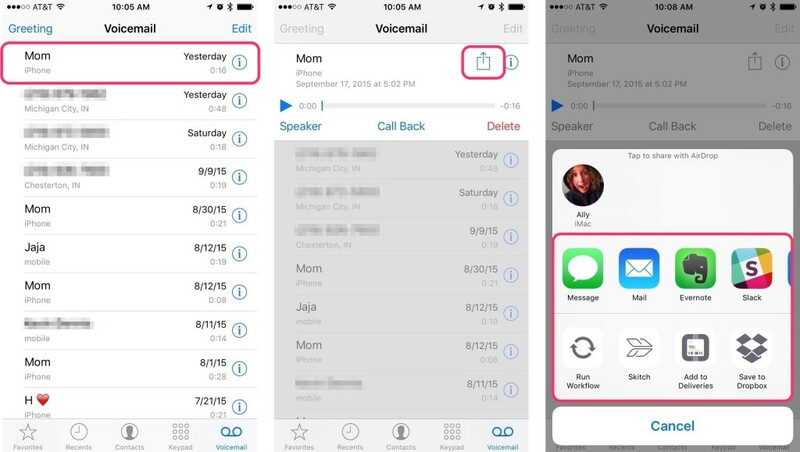 You can now share your voicemail over message or Airdrop. You can also save it into other applications like Evernote and Dropbox. There are many other third party applications like Skitch and Slack in which you can store your voicemails too. You can now save your voicemails conveniently in various IOS applications which support .m4a files. No more issue of storage space on your iPhone. Just move your voicemails into any of the storage options listed above and enjoy a hassle free unlimited list of your voicemails.